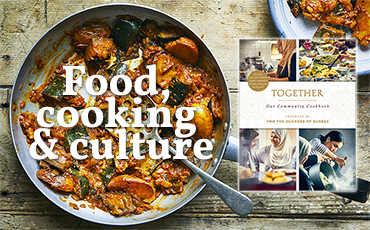 Marion and Robert Appelbaum will give us an introduction to the early history of cookbooks and cultural identity, with examples from the cookbook Together (Grenfell Community Cook Book). What’s more, Marion will treat us all to scrumptious nibbles from that book. Join us for a Sunday afternoon all about food, fun, and friendly encounters. This talk is also the starting point for a cookery course with Marion Appelbaum. She will tell us more about the course during the evening, and anyone interested can sign up for the classes on the spot. Tickets 70:- (scrumptious nibbles included). Get your ticket at the bookshop today – limited seating.